A high quality 1m satellite cable, F plug to F plug satellite dish lead. 40m white high quality TV aerial cable. 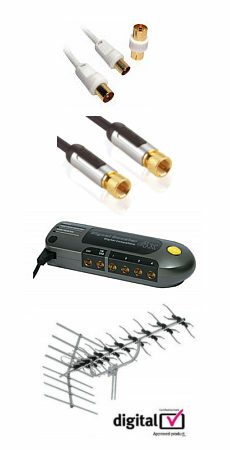 24k gold plated aerial connectors for superior signal transfer High quality coax conductors to minimise cable loss. White jacket, ideal for running around white skirting boards. Suitable for Analogue, Freeview and Freeview HD TV. 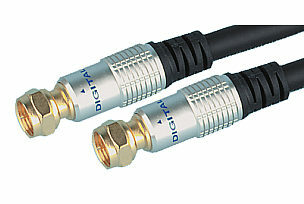 Male to male, supplied with adapter to convert one end to female. Length 40 meters. A high quality angle plug to angled socket TV aerial cable manufactured with 90 degree connectors. Length 1.5m. High quality coaxial cable 3C2V/RG59 75 ohm. Jacket white PVC. Nickel plated angled male plug and female socket lead.